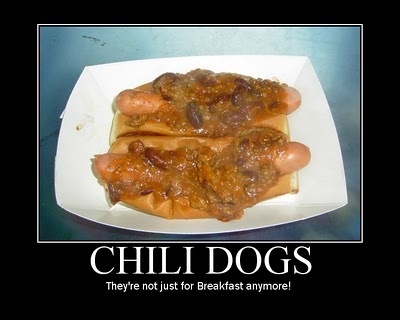 My mom sent me this via email today. It's quite a story! The Media (Accidentally? )Missed this one!!!! 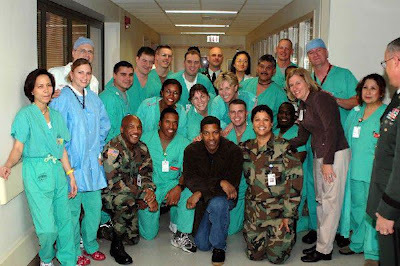 Don't know whether you heard about this but Denzel Washington and his family visited the troops at Brook Army Medical Center, in San Antonio, Texas (BAMC) the other day. This is where soldiers who have been evacuated from Germany come to be hospitalized in the United States, especially burn victims There are some buildings there called Fisher Houses. The Fisher House is a Hotel where soldiers' families can stay, for little or no charge, while their soldier is staying on base, but as you can imagine, they are almost filled most of the time. While Denzel Washington was visiting BAMC, they gave him a tour of one of the Fisher Houses. He asked how much one of them would cost to build. He took his checkbook out and wrote a check for the full amount right there on the spot. The soldiers overseas were amazed to hear this story and want to get the word out to the American public, because it warmed their hearts to hear it. The question is - why do Britney Spears, Madonna, Tom Cruise and other Hollywood fluff make front page news with their ridiculous antics and Denzel Washington's charity doesn't even make page 3 in the Metro section of any newspaper except the Local newspaper in San Antonio? 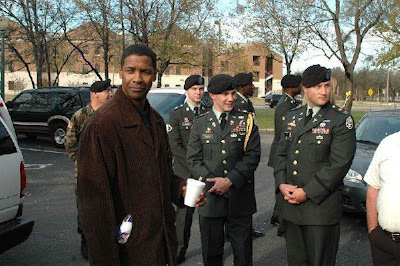 Denzel Washington: A true American and friend to all in uniform! I think Paris Hilton has actually donated most of her brain to some charity or other so Denzyl's not the only one...!